The Moscow Presnensky District Court in Moscow has sentenced former official of the Russian Defense Ministry Yevgenia Vasilyeva to five years in a medium-security penal colony as part of the Oboronservice case, an Interfax correspondent reported from the court room. 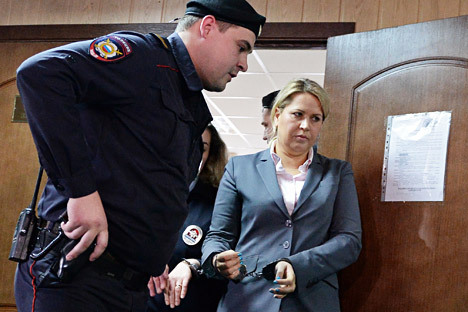 Vasilyeva, who was the key defendant in the Oboronservice case, was taken into custody in the court room. She was escorted from the courtroom to a convoy room and was handcuffed. The convict declined to answer numerous questions from the press and followed the police convoy with her head bowed. Vasiliyeva will serve 2.5 years in a penal colony because she has been under house arrest since November 2012 and her house arrest counts towards her jail time. Four other defendants in the case got sentences ranging from to 3.5 to four years and three months. Specifically, Larisa Yegorova received four years and three months in a general regime penal colony, Irina Yegorova received four years in a general regime penal colony, Yury Grekhnev received four years in a general regime penal colony, and Maxim Zakutailov received 3.5 years in a in a general regime penal colony. The court also ordered the recovery of over 216 million rubles Vasilyeva and the other defendants in the Oboronservice case. However, Vasilyeva can hope to be released on parole in the near future since has spent 2.5 years under house arrest and that means she has served half of her sentence already. According the current legislation, a convict who has served half of his sentence can apply for parole after the sentence takes legal effect. Meanwhile, Khasan Borokov, a lawyer for Vasilyeva, said the defense lawyers are shocked by the sentence and measures will be taken to file an appeal in the nearest future. "Honestly, I am shocked. We will file an appeal in the nearest future," he told reporters on Friday. He said the lawyers will first file an appeal to contest the change in Vasilyeva's measure of restraint in court. The lawyer declined to comment on the information that Vasilyeva can hope for parole in the nearest future. "I can say that one day of house arrest counts as one day in custody," he said. The prosecutors in turn have not decided yet whether they will contest the sentences handed out in the Oboronservice case. "We need to study the text of the sentences in detail to check if they are substantiated. We can only state our position on the possibility of appeal after we do that," Prosecutor General's Office official Vera Pashkovskaya told Interfax. The Investigative Committee is satisfied with its work in the Oboronservice criminal case, Investigative Committee spokesman Vladimir Markin said. "We are satisfied with the work done by the investigation, and this primarily concerns property returned to the state, which had been embezzled," Markin said when asked by Interfax whether the Investigative Committee was satisfied with the sentence that a court handed down on Vasilyeva on Friday. "Talking about whether we are satisfied by the fact that the defendants have received real jail time is not within our purview. This is a court's decision. We have done our job in a professional way, a very professional and principled way," Markin said. A source familiar with the situation told Interfax that Vasilyeva is expected to be escorted to the detention facility #6 in Moscow. "According to preliminary information, Vasilyeva will be held at detention facility No. 6 in Moscow before the sentence takes effect," the source said. Yevgenia Vasilyeva, former head of the Defense Ministry's property relations department, was a key suspect in the criminal case involving the sale of real estate and the embezzlement of funds belonging to the Oboronservice company, which is controlled by the Defense Ministry. According to the sentence, Vasilyeva was found guilty on six counts of fraud, the legalization of the proceeds of crime and the abuse of office. Initially the damage caused by Vasilyeva was estimated at three billion rubles. Later the damage she is expected to recover was cut to something more than 216 million. Both prosecutors and defense have 10 days to contest the sentence of the Presnensky District Court. The Moscow City Court will hear the appeals. The trial of the high-profile criminal case began in the Moscow Presnensky Court on July 1, 2014. During the court investigation, dozens of volumes of documents were studied and numerous witnesses were questioned. Former Russian defense minister Anatoly Serdyukov testified in court on January 15, 2015. he said the defendants' actions were good for the ministry and the state and had not inflicted harm on them. In October 2012, several criminal cases were opened on the basis of deals involving Oboronservice real estate, land and shares. As a result, several high-ranking officials, including Anatoly Serdyukov, who was then defense minister, lost their posts. Vasilyeva is charged with twelve counts of crime. The total damage done by those crimes is estimated at over 3 billion rubles. Vasilyeva denies her guilt. According to the indictment, Vasilyeva misled Serdyukov into committing crimes.